Looking at the latest run of the ECMWF weather model the news is not good. The front is moving in and will pass through very quickly. 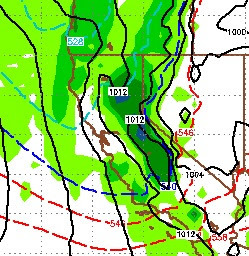 The bulk of the moisture will stay on the western Sierra. I am looking at about .25 - .5 total liquid for the Carson Range. That will equate 3-6 inches of snow max. This front is coming in with some very cool air as well, temperatures will plummet. Any precip in the leeward valleys will be mostly snow. However, I do not see any accumulation. Also, our persistent high pressure ridge will move back into place and begin blocking storms as they attempt to move into our area. I am not seeing any significant storms for at least the next 10 days. 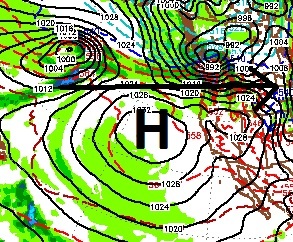 The problems is our ridge of high pressure coupled with no blocking in the upper plains to Hudson bay. This is allowing storms to move inland and continue tracking due east. It is worth noting that at least one veteran meteorologist believes we have a decent chance of a storm around the 22nd of this month. I do not see it. Our high pressure ridge is going to park and stay there for at least a week. However, there are many other variables in play this year that make forecasting any more than 3 days down the road, very unreliable, so let's hope the veteran meteorologist is right and I am wrong.